For other uses, see Direct democracy (disambiguation). In a representative democracy, people vote for representatives who then enact policy initiatives. In direct democracy, people decide on policies without any intermediary. Depending on the particular system in use, direct democracy might entail passing executive decisions, the use of sortition, making laws, directly electing or dismissing officials, and conducting trials. Two leading forms of direct democracy are participatory democracy and deliberative democracy. A 'citizen-initiated referendum' (also called an initiative) empowers members of the general public to propose, by petition, specific statutory measures or constitutional reforms to the government and, as with referendums, the vote may be binding or simply advisory. Initiatives may be direct or indirect: With the direct initiative, a successful proposition is placed directly on the ballot to be subject to vote (as exemplified by California's system). With an indirect initiative, a successful proposition is first presented to the legislature for their consideration; however, if no acceptable action is taken after a designated period of time, the proposition moves to direct popular vote. Such a form of indirect initiative is utilized by Switzerland for constitutional amendments. A deliberative referendum is a referendum that increases public deliberation through purposeful institutional design. The earliest known direct democracy is said to be the Athenian democracy in the 5th century BC, although it was not an inclusive democracy: women, foreigners, and slaves were excluded from it. The main bodies in the Athenian democracy were the assembly, composed of male citizens; the boulê, composed of 500 citizens; and the law courts, composed of a massive number of jurors chosen by lot, with no judges. There were only about 30,000 male citizens, but several thousand of them were politically active in each year, and many of them quite regularly for years on end. The Athenian democracy was direct not only in the sense that decisions were made by the assembled people, but also in the sense that the people through the assembly, boulê, and law courts controlled the entire political process, and a large proportion of citizens were involved constantly in the public business. Modern democracies, being representative, not direct, do not resemble the Athenian system. Also relevant to the history of direct democracy is the history of Ancient Rome, specifically the Roman Republic, beginning around 509 BC. Rome displayed many aspects of democracy, both direct and indirect, from the era of Roman monarchy all the way to the collapse of the Roman Empire. Indeed, the Senate, formed in the first days of the city, lasted through the Kingdom, Republic, and Empire, and even continued after the decline of Western Rome; and its structure and regulations continue to influence legislative bodies worldwide. As to direct democracy, the ancient Roman Republic had a system of citizen lawmaking, or citizen formulation and passage of law, and a citizen veto of legislature-made law. Many historians mark the end of the Republic with the passage of a law named the Lex Titia, 27 November 43 BC, which eliminated many oversight provisions. Athenian democracy developed in the Greek city-state of Athens, comprising the city of Athens and the surrounding territory of Attica, around 600 BC. Athens was one of the very first known democracies. Other Greek cities set up democracies, and even though most followed an Athenian model, none were as powerful, stable, or well-documented as that of Athens. In the direct democracy of Athens, the citizens did not nominate representatives to vote on legislation and executive bills on their behalf (as in the United States) but instead voted as individuals. The public opinion of voters was influenced by the political satire of the comic poets in the theatres. Solon (694 BC), Cleisthenes (608–607 BCE), and Ephialtes (562 BC) all contributed to the development of Athenian democracy. Historians differ on which of them was responsible for which institution, and which of them most represented a truly democratic movement. It is most usual to date Athenian democracy from Cleisthenes, since Solon's constitution fell and was replaced by the tyranny of Peisistratus, whereas Ephialtes revised Cleisthenes' constitution relatively peacefully. Hipparchus, the brother of the tyrant Hippias, was killed by Harmodius and Aristogeiton, who were subsequently honored by the Athenians for their alleged restoration of Athenian freedom. 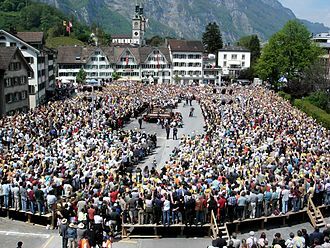 The pure form of direct democracy exists only in the Swiss cantons of Appenzell Innerrhoden and Glarus. The Swiss Confederation is a semi-direct democracy (representative democracy with strong instruments of direct democracy). The nature of direct democracy in Switzerland is fundamentally complemented by its federal governmental structures (in German also called the Subsidiaritätsprinzip). In Switzerland, simple majorities are sufficient at the municipal and cantonal level, but at the federal level double majorities are required on constitutional issues. A double majority requires approval by a majority of individuals voting, and also by a majority of cantons. Thus, in Switzerland a citizen-proposed amendment to the federal constitution (i.e. popular initiative) cannot be passed at the federal level if a majority of the people approve but a majority of the cantons disapprove. For referendums or propositions in general terms (like the principle of a general revision of the Constitution), a majority of those voting is sufficient (Swiss Constitution, 2005). In 1890, when the provisions for Swiss national citizen lawmaking were being debated by civil society and government, the Swiss adopted the idea of double majorities from the United States Congress, in which House votes were to represent the people and Senate votes were to represent the states. According to its supporters, this "legitimacy-rich" approach to national citizen lawmaking has been very successful. Kris Kobach claims that Switzerland has had tandem successes both socially and economically which are matched by only a few other nations. Kobach states at the end of his book, "Too often, observers deem Switzerland an oddity among political systems. It is more appropriate to regard it as a pioneer." Finally, the Swiss political system, including its direct democratic devices in a multi-level governance context, becomes increasingly interesting for scholars of European Union integration. In the New England region of the United States, towns in areas such as Vermont decide local affairs through the direct democratic process of the town meeting. This is the oldest form of direct democracy in the United States, and predates the founding of the country by at least a century. John Witherspoon, one of the signers of the Declaration of Independence, said: "Pure democracy cannot subsist long nor be carried far into the departments of state – it is very subject to caprice and the madness of popular rage." Alexander Hamilton said, "That a pure democracy if it were practicable would be the most perfect government. Experience has proved that no position is more false than this. The ancient democracies in which the people themselves deliberated never possessed one good feature of government. Their very character was tyranny; their figure, deformity." Despite the framers' intentions in the beginning of the republic, ballot measures and their corresponding referendums have been widely used at the state and sub-state level. There is much state and federal case law, from the early 1900s to the 1990s, that protects the people's right to each of these direct democracy governance components (Magleby, 1984, and Zimmerman, 1999). The first United States Supreme Court ruling in favor of the citizen lawmaking was in Pacific States Telephone and Telegraph Company v. Oregon, 223 U.S. 118 in 1912 (Zimmerman, December 1999). President Theodore Roosevelt, in his "Charter of Democracy" speech to the 1912 Ohio constitutional convention, stated: "I believe in the Initiative and Referendum, which should be used not to destroy representative government, but to correct it whenever it becomes misrepresentative." Statute law referendum is a constitutionally-defined, citizen-initiated petition process of the "proposed veto of all or part of a legislature-made law", which, if successful, repeals the standing law. It is used at the state level in twenty-four states: Alaska, Arizona, Arkansas, California, Colorado, Idaho, Kentucky, Maine, Maryland, Massachusetts, Michigan, Missouri, Montana, Nebraska, Nevada, New Mexico, North Dakota, Ohio, Oklahoma, Oregon, South Dakota, Utah, Washington and Wyoming (Cronin, 1989). The recall election is a citizen-initiated process which, if successful, removes an elected official from office and replaces him or her. The first recall device in the United States was adopted in Los Angeles in 1903. Typically, the process involves the collection of citizen petitions for the recall of an elected official; if a sufficient number of valid signatures and collected and verified, a recall election is triggered. In U.S. history, there have been three gubernatorial recall elections in U.S. history (two of which resulted in the recall of the governor) and 38 recall elections for state legislators (55% of which succeeded). Nineteen states and the District of Columbia have a recall function for state officials. Additional states have recall functions for local jurisdictions. Some states require specific grounds for a recall petition campaign. Territories held by the Zapatistas in Mexico also employ elements of direct democracy. At a local level, people attend a general assembly of around 300 families where anyone over the age of 12 can participate in decision-making, these assemblies strive to reach a consensus but are willing to fall back to a majority vote. Each community has 3 main administrative structures: (1) the commissariat, in charge of day-to day administration; (2) the council for land control, which deals with forestry and disputes with neighboring communities; and (3) the agencia, a community police agency. The communities form a federation with other communities to create an autonomous municipalities, which form further federations with other municipalities to create a region. The Zapatistas are composed of five regions, in total having a population of around 300,000 people. In Syrian Kurdistan, in the cantons of Rojava, a new model of polity is exercised by the Kurdish freedom movement, that of Democratic confederalism. This model has been developed by Abdullah Öcalan, the leader of the Kurdistan Workers' Party, on the basis of the Kurdish revolutionary experience and traditions, and of the theory of Communalism developed by Murray Bookchin. At the opposite of the Nation-State model of sovereignty, Democratic confederalism rests on the principle of radical self-government, where political decisions are taken in popular assemblies at the level of the commune, which will send delegates to the confederate level of the district and the canton. This bottom-up political structure coexists with the democratic self-administration, as organized in the Charter of the Social Contract adopted by the cantons of Rojava in 2014. These two structures constitute a situation characterized as one of dual power by David Graeber, though a peculiar one as they are both formed by the same movement. Compared to other experiences categorized as ones of direct democracy such as OWS, the Rojava experiment presents only several elements of direct democracy, namely the organization of the self-governing communes in popular assemblies where everybody can participate, the confederation of these communes through imperative and recallable mandates, the rotation of charges (often biannually) and the absence of a centralized power. In theory, Öcalan describes the principle of Democratic Confederalism as follows: "In contrast to a centralist and bureaucratic understanding of administration and exercise of power confederalism poses a type of political self-administration where all groups of the society and all cultural identities can express themselves in local meetings, general conventions and councils.". In practice, Rojava is organized on a system of "Four Level Councils": the Commune, the Neighborhood, the District, and the People's Council of West Kurdistan. Each level nominates delegates for the next level with imperative mandates as well as recallable mandates. For the system to respect the principle of political equality, either everyone needs to be involved or there needs to be a representative random sample of people chosen to take part in the discussion. In the definition used by scholars such as James Fishkin, deliberative democracy is a form of direct democracy which satisfies the requirement for deliberation and equality but does not make provision to involve everyone who wants to be included in the discussion. Participatory democracy, by Fishkin's definition, allows inclusive participation and deliberation, but at a cost of sacrificing equality, because if widespread participation is allowed, sufficient resources rarely will be available to compensate people who sacrifice their time to participate in the deliberation. Therefore, participants tend to be those with a strong interest in the issue to be decided and often will not therefore be representative of the overall population. Fishkin instead argues that random sampling should be used to select a small, but still representative, number of people from the general public. Anarchists have advocated forms of direct democracy as an alternative to the centralized state and capitalism; however, others (such as individualist anarchists) have criticized direct democracy and democracy in general for ignoring the rights of the minority, and instead have advocated a form of consensus decision-making. Libertarian Marxists, however, fully support direct democracy in the form of the proletarian republic and see majority rule and citizen participation as virtues. Libertarian socialists such as anarcho-communists and anarcho-syndicalists advocate direct democracy. The Young Communist League USA in particular refers to representative democracy as "bourgeois democracy", implying that they see direct democracy as "true democracy". Democratic schools modeled on Summerhill School resolve conflicts and make school policy decisions through full school meetings in which the votes of students and staff are weighted equally. Reform of the United Nations :United Nations Parliamentary Assembly, direct elected parliamentarians instead of administrations' diplomaticians and United Nations Secretary-General elect by popular vote. ^ Budge, Ian (2001). "Direct democracy". In Clarke, Paul A.B. ; Foweraker, Joe (eds.). Encyclopedia of Political Thought. Taylor & Francis. ISBN 9780415193962. ^ a b c Hirschbühl (2011a). ^ a b c Hirschbühl (2011b). ^ a b c Hirschbühl (2011c). ^ a b c Hirschbühl (2011d). ^ a b Fishkin 2011, Chapters 2 & 3. ^ Julia Slater (28 June 2013). "The Swiss vote more than any other country". Berne, Switzerland: swissinfo.ch – the international service of the Swiss Broadcasting Corporation. Retrieved 2015-07-27. ^ Duc-Quang Nguyen (17 June 2015). "How direct democracy has grown over the decades". Berne, Switzerland: swissinfo.ch – the international service of the Swiss Broadcasting Corporation. Retrieved 2015-07-27. ^ Bryan, Frank M. (15 March 2010). "Real Democracy: The New England Town Meeting and How It Works". University of Chicago Press. Retrieved 27 April 2017 – via Google Books. ^ Recall of State Officials, National Conference of State Legislatures (March 8, 2016). ^ Tax, Meredith. "The Revolution in Rojava". Dissent Magazin. Retrieved 3 September 2015. ^ membership Cmte. "Young Communist League USA – Frequently Asked Questions". Yclusa.org. Retrieved 2010-05-02. ^ Burgh, Gilbert (2006). Ethics and the Community of Inquiry: Education for Deliberative Democracy. Cengage Learning Australia. p. 98. ISBN 0-17-012219-0. 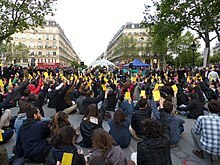 Wikimedia Commons has media related to Direct democracy.